All that the Oxford Dictionary of National Biography says about the war experience of Edward John Moreton Drax, eighteenth baron Dunsany, is the following: “During the First World War, Dunsany served as captain with the Fifth Inniskilling Fusiliers in France and was wounded during the Easter rising in 1916.” It is hardly an adequate account: apart from anything else, his service in France was after Easter 1916, and he was not then with the Fifth Battalion. On Sunday August 9, a hundred volunteers were harangued on the cricket ground at Dunsany Castle by Dunsany himself; a week later some 2000 volunteers gathered at Slane. Many of these were members of the Irish Volunteers, a nationalist military group formed in 1913 to counter the threat of the Ulster Volunteers. The Nationalist leader John Redmond hoped that the Irish would prove their loyalty and their political responsibility by fighting in the Great War alongside the British Army, and many indeed did so, joining a reformed National Volunteers (and leaving a rump of nationalists who refused to take part in the War as the Irish Volunteers). One issue was whether they would fight under their own officers, but Kitchener refused to allow them to do so—while giving permission to the Ulster Volunteers. Those Irish who joined the Army had to join one of the established regiments. Dunsany himself joined the 5th Battalion of the Royal Inniskilling Fusiliers, early in September 1915. Two weeks after Shaw’s visit, Dunsany was told that he was going overseas: he was initially stationed in Basingstoke. 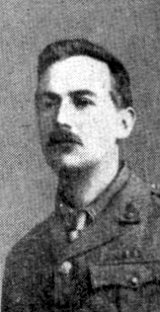 But although his regiment went to Gallipoli in 1915, Dunsany was transferred to the reserve battalion in Londonderry, to await possible transfer to France. Generals were continually telling us that we were going to France in a very short time. And I believe that they were speaking the truth, and that events at one time seemed like to demand the presence of even untrained battalions in the field, but actually it was many months before the battalion went out, and not to France [it was Gallipoli]; and I, by then with the Third Battalion, stationed at Londonderry, did not get my orders to go until I got a telegram from the War Office in April 1916, ordering me to proceed to France (PS 267). By that time, however, he was in the King George V Hospital in Dublin. Alone of all the writers I am dealing with on this site, Dunsany was wounded at home, and not in the field. All that we know about this event comes from his autobiography Patches of Sunlight, published in 1938. Dunsany was on leave from Londonderry at Easter, staying at home in Dunsany Castle. With him were his friends Lindsay (who was back from Gallipoli), and Brigadier General Hammond. Hammond was whisked off in an armoured car to the barracks of the Curragh, near Kildare, leaving no warning. Then the family governess came back from the station, as the trains were not running. There were rumours of a rebellion. “To stride into G.H.Q., Dublin, and offer my services, and then to find that there had only been a scrimmage between a policeman and a couple of boys, would be extremely ridiculous” (268). But he went anyway, and offered his services. The staff officer told him to go to Major Carter at Amiens Street, and put himself under his orders. Lindsay came with him. They went the shortest route, along the quays, and met a part of the rebel army on the way, “drawn up across the road behind a row of barrels, about a hundred yards on our side of the Four Courts” (268). They stood up, and fired. Dunsany got out of the car, and lay down in the road, “and many bullets went by me before I was hit.” His chauffeur was shot, but not fatally. Dunsany went across the road to a doorway; he thought afterwards that if they had aimed in front of his neck as he ran, they would have killed him; as it was, their shots went behind him. But he had nowhere to go, and he was taken prisoner. The man that took me prisoner, looking at the hole in my face made by one of the bullets, a ricochet, made a remark that people often consider funny, but it was quite simply said and sincerely meant: he said, “I am sorry.” He led me back to the rest, and one of them came for me with his bayonet, now cleared of its scabbard; but the bullet having made my wits rather alert than otherwise I saw from his heroic attitude that there was no malice about him, but he merely thought that to bayonet me might be a fine thing to do. When the other man suggested, with little more than a shake of his head, that it was not, he gave up the idea altogether. “Where’s a doctor? Where’s a doctor?” they shouted. “Here’s a man bleeding to death” (270). Lindsay had ducked behind the car and was safe. He examined Dunsany, and pulled out a jagged piece of nickel or lead from his face. “He did not allow himself to be marched off to his prison under the Four Courts until he had seen that everything was done form me that could be done” (271). Dunsany was taken to the hospital in Jervis Street, and the nuns looked after him very well. He never forgot what Sister M. Basil said, as she saw Dunsany look out of the window one morning and watch the bullets whizz by: “The nasty little things” (272). Dunsany was taken into hospital on the Tuesday after Easter. He was there for a week, listening to the sounds of firing. The noise got worse once the British artillery started shelling the centre of Dublin. By nightfall on the Wednesday the Leinsters and Sherwood Foresters had got very close, and the shooting was intense. For quite a minute nobody was hit, and then a voice cried out calling on saints, and was silent. What struck me most about that clear cry in the night was that there was surprise in it, as though the man had not thought that he would be hit. For the rest of the night I heard men dying, and when the cries seemed to have reached an apex beyond which one had not thought that horror could go, one voice was lifted up more horrible than anything else in that night, and this came from a wounded dog. A man was carried down the street to the hospital, calling on God with every breath that he took, for he only got each breath with great difficult. He was put in the next room to me. And many more were brought in. I used to enquire how these men were doing, when I could no longer hear them, and I always got the same answer, hearing a word that is rarely heard by patients in hospitals: “Ah, he’s dead long ago” (274). The guns went on all Thursday, and early on Friday morning there was clearly a danger of fire. Dunsany heard afterwards that the fire brigade had turned out to save Jervis Street Hospital. The flames of Dublin could be seen from Dunsany Castle, and people there feared he was dead. Dunsany had other things to worry about: a doctor had discovered that the bullet had gone deeper than at first thought, and “there was the possibility of septic trouble”. Later on the Friday, the sound of machine guns came closer, and the nuns went away to say their prayers. “We have said our last prayers,” they reported. When Dunsany woke up on Saturday morning, the British had captured the hospital. On Sunday morning I heard a triumphant sound, and looking out of the window I saw a triumphant sight. Poets may picture Victory with her trumpet, walking the field of battle, but who has seen with his eyes anything quite so like her as I saw then. I saw one corporal going alone through Dublin, blowing the Cease Fire, every now and then on his bugle. Both sides seemed to obey him (277-78). Lindsay came to see Dunsany in the hospital, “having arranged the surrender of four hundred men in the Four Courts” (279). There had been almost no food in the Four Courts, and he, poor man, had had to exist for a week largely on the contents of the cellars: “sherry, champagne, port, claret, and benedictine”. Soon the doctors were able to operate on Dunsany, and take out the bullet, which had lodged not too far from his brain. The doctors kept a piece of Dunsany’s skull as a souvenir, which Dunsany got the bullet. For some years afterwards Dunsany had to get medical help for “the slight repairs that are occasionally necessary to keep the track of my bullet tidy” (281). He had a scar, and his nose and lip on one side were permanently paralysed. Dunsany got a month’s leave, and applied for more, but did not get it, so he went back to Ebrington Barracks in Londonderry for light duty. Mostly the letters that he wrote to his wife were as light and uninformative as the passages about the Great War in his autobiography. Amory quotes one (p. 144), written from Amiens in around October 1917, which wasn’t. For half my way the journey lay through the abomination of desolation, for the other half France smiled; and I noticed that we have no way of knowing where we are, that is was autumn. Verily such a journey as I made this morning was never until recently made by man. Imagine Waterloo, Sebastopol, Ladysmith, Pompeii, Troy, Timgad, Tel el Kebir, Sodom and Gomorrah endlessly stretching one into the other; and twisted, bare, ghoulish trees leering downward at graves; and scenes very like Doré’s crucifixion and realities like the blackest dreams of Sime; tanks lying with their noses pointing upwards still sniffing towards an enemy long since stiff or blown away in fragments like a wounded rhinoceros’ dying. Early in 1918 he left France, and went to work in M.I.7B (i), in the War Office. He later learned that when they had heard he was coming, officers went to the London Library to see if they had any books by Lord Dunsany. “Certainly,” said the librarian, and pulled down Gaul or Teuton?. It had been written by Admiral Lord Dunsany, our lord’s grandfather. Dunsany mentions that J.B. Morton (the comic writer Beachcomber) worked there; he did not mention A.A. Milne. Each worked in a separate room, and there seems to have been a good deal of secrecy, for not all knew what they colleagues were doing. They were writing propaganda, designed to lower German morale as well as raise the morale of the Allies. Dunsany wrote short pieces for newspapers all over the world: some were published later as Tales of War (1918) and Unhappy Far-Off Things (1919). Dunsany visited the front one more time, in October 1918, to gather material for his writing. Bourlon Wood lay away to the right, and far away in front of me our guns were firing and shells were bursting, like foam at the edge of a sea that was already ebbing fast. In the old Nomansland wire lay rusting in shell-holes, and a British helmet lay near the old German trenches with six foot of weeds luxuriating beside it. It was this scene that came to me vividly on the night of November 8th, when I knew that the Armistice was about to be signed, the neglected dead lying with wasted wire and fragments of shells, and the guns away to the eastward with the advancing line; and I wrote a poem called A Dirge of Victory, picturing Victory with her trumpet, not exulting among the army, but blowing her trumpet downward amongst the weeks to tell the dead they had not fought in vain (296). He published his autobiography in 1938, but the story he had to tell ended only three pages later, still in 1918. Within a week of the war ending MI7B(i) was disbanded, and Dunsany joined the Third Battalion of Inniskillings in Cornwall, but there was nothing for him to do, and he went home. He was still technically in the army, however, and in June 1919 spent a few weeks with the American army on the Rhine. At Dunsany Castle there is a very interesting album of photos taken by Dunsany during the War; also his hand-drawn (very imaginative) suggestions for new uniforms for the British Army (his suggestion for the uniform of a war expert is that it should be the same as that of an astrologer or a soothsayer, since they have about the same touch with reality). The Oxford Dictionary of National Biography is by Leonard R.N. Ashley, in volume 44 (Phelps to Poston), amid a host of other Plunketts who were of significance in Irish and British history. Dunsany’s Patches of Sunlight (London: William Heinemann, 1938) is the main source for the above information, supplemented by Mark Amory, Biography of Lord Dunsany (London: Collins, 1972). The title of his grandfather’s book was actually GAUL OR TEUTON? Amory gets it wrong. Thanks: I have made the correction! Thanks! I have added your comment, as above, to the page on “Lord Dunsany in the Great War”!